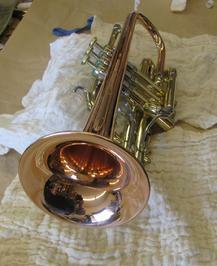 Pictured below are the after pictures from a couple trumpet overhauls. 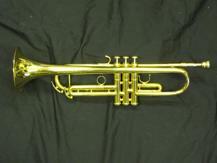 The first is Al Naylor's Lawler trumpet. 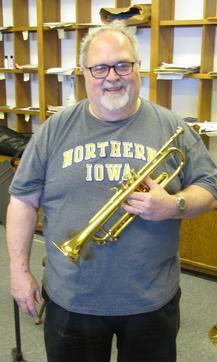 As a professional, Al constantly has his trumpet in his hands. Unfortunately, those hands also have a tendency to wear holes in his horns. Merlin replaced the bell and gold plated the entire instrument. 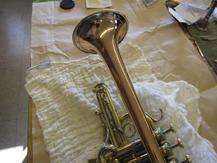 Besides looking great, the gold plating is the only surefire way to protect an instrument from this kind of corrosion. Al also likes the way the gold gives a warmer sound that can still punch through when desired. This 1951 Reynolds Contempora Cornet has been overhauled with a fresh coat of baked on epoxy lacquer. 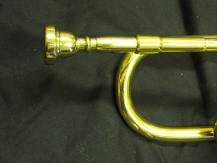 The bell on this horn is made from a material Reynolds dubbed "Bronze-o-lyte," although it is unclear if it truly is a bronze bell (copper and tin). The reddish color comes from the way the copper has aged and reacted with light. 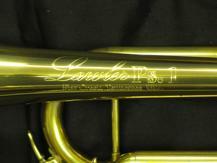 For more information on The Reynolds company and the Contempora Cornet visit http://contemporacorner.com/ .